For Jonathan Fornaci, technology has been a life-long interest. But on a visit to Las Vegas, it was his passion for yoga that altered his career path. Today, Fornaci is one of three major shareholders of TruFusion LLC. He serves as chief operating officer of the fitness business that he says is changing the entire fitness experience by making better use of technology, variety and ceremony. His partners are Martin Hinton, who is responsible for developing the creative programs offered through TruFusion, and Michael Borden, who is well known for founding Switch Communications in Nevada. Hinton has 25 years of experience developing unique fitness workouts, including one for firefighters on the beaches of Hawaii. Fornaci is from San Francisco and holds a bachelor’s degree in physics from the University of California, Berkeley. His extensive experience with corporate expansions — including Straw Hat Pizza and Rita’s Italian Ice — made him a good fit for TruFusion. Fornaci believes the TruFusion culture is unique in the industry. He describes it as “a culture of embrace,” both supportive and warm. It’s working, Fornaci says, pointing to maxed-out TruFusion classes and a growing franchise business. He reports eight franchises have been sold in Nevada, with at least two to open before the end of the year. Lawyers are working on the documents for additional franchises in California, Florida and Utah. The original Las Vegas TruFusion Studio (8575 S. Eastern Ave.) employs 72 and there are 18 in the corporate office. 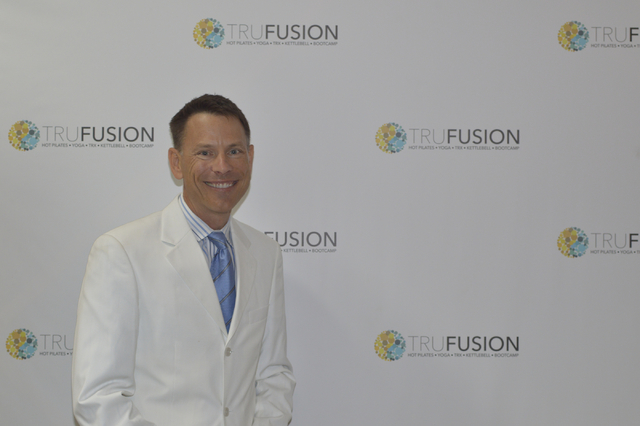 A. TruFusion is a new concept in health and fitness. They brought together a number of different genres into this one studio. The whole concept here is bringing together disciplines you would never think of and making all that very ceremonial. All of our classes, no matter what you do, have a ceremonial aspect. We do hot pilates, hot yoga; there’s a class going on soon called hot booty yoga which is a blend of yoga and Polynesian dance. We do barre, hot barre, like ballet barre classes, TRX, TRX kettle bell battle rope class. We combined all those different genres together. In these classes, you’ll burn 600-800 calories an hour. If you want to do a Paleo diet, we have a nutritionist on staff. A. I was out here visiting a friend of mine and he said ‘you gotta come to this new studio’ because I work out a lot. I do yoga in San Francisco and I do all these different forms of working out. Q. How did you combine technology and business to expand a number of different companies — not only TruFusion but also companies like Straw Hat Pizza to Rita’s Italian Ice? A. I spent my first 15 years in technology. There’s no business that you can do without the use of technology. I was always fascinated. I got my degree in physics, so I like technology a lot. But technology for technology sake is boring; there’s no benefit. You can implement it and use it to really advance business. Like for us, we’re doing so much with technology that we’re rolling out with TruFusion. We’re developing mobile apps so that you can track everything about your workout. You can challenge your friends, see your daily progress, all the calories. Q. What technology do you see most businesses failing to optimize? A. Understanding how it affects the end user. If the technology is really cool but has no benefit to you or me, then it’s a waste of time. That’s what I’ve seen a lot. Focus on what the customer needs. Q. How does TruFusion change the fitness industry? A. Bringing together so many disciplines … In a week, we do over 200 different classes. The nice thing is you’re not going to get bored; you’re going to have a huge focus on overall fitness of the body. When you go into our classes, you have somebody that is actually guiding you through everything. We’re not doing anything that’s going to harm you. I think that’s the biggest thing, people get injured all the time (in traditional gym settings). You’re not going to get harmed from the yoga. We have so many restorative classes that if people are doing stuff we say, “Hey listen you’ve done three different classes in the last couple days, let’s do a restorative class.” To me that’s the biggest thing that differentiates us from everybody else. You can come here, have one membership, and get a complete work out. You’re not going to get bulked up, (have) injuries to your muscles … here you’re not going to have those issues. Q. As the chief operating officer what numbers do you watch regularly? A. The two numbers would be memberships and income; but for me it’s the memberships. This studio is almost completely maxed out. We can’t take any more members — which is a great problem to have but still it’s a problem. People are wait listed. We are adding classes until 10-11 o’clock at night. Q. What should investors know about the potential of TruFusion as a franchise? A. In the franchise world, if you’re making 10 to 12 percent income off your gross, you’re doing fantastic. Last year, this business made 26 percent. This year, year to date, we’re at 32 percent. From a franchisee’s perspective… they’re investing between $500,000 and $800,000. In your first year, you have 100 percent of your cash out. If you’re being conservative and you’re doing $3 million a year; you’re pulling out 25 percent of your gross. That’s pretty great business.